Bake this Yoda Cake, You Will! Aussie Star Wars fan Sandra make a Jedi Master yummier than he is wise with this awesome Yoda Cake. Any celebration is better with an appearance from everyone's favorite astromech droid. 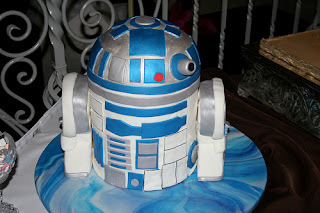 In fact, this groom's wedding cake of R2-D2 makes us downright giddy. The Annie Awards are presented by The International Animated Film Society. And if you want to look extra fashionable to celebrate the win, check out Robot Chicken’s own official Stoopid Monkey lightsaber shirts and gear here. From the creative kids at Worth1000. I have posted the scripts here as an alternative to Dotster. Force. But beware. Anger, fear, aggression.